One of the pleasures of having come to Basel was, that I was suddenly confronted with what seemed to me rather strange liturgical minhaggim, as up until then I had assumed that my tradition was of course the standard; a common human fallacy. One of the things I discovered, is that, while every synagogue I could remember visiting up until then, included Psalm 30 (מזמור שיר חנוכת הבית) in the morning liturgy, to be recited before Baruch SheAmar, in Basel, it was ignored. My first indication that this Psalm’s inclusion in the liturgy deserved some scrutiny came even before I encountered Minhag Basel, from hearing about R’ Joseph Ber Soloveitchik’s personal minhag of reciting said Psalm only after Barukh SheAmar, for in his opinion it was only within the framework of Pessuqei deZimra that one could begin to recite Psalms in the morning liturgy. (However, he had no objection to the liturgical recitation of Psalms after Pessuqei deZimra.) However, that was a chiddush of R’ Soloveitchik; it never was an established minhag. So how come that it is recited in most communities, while many Yeckishe communities skip it? As it turns out, the real question is: Why it is said everywhere else? For upon investigation, we discover that it is absent from older siddurim. The Jewish National University Library, at Hebrew U., publishes an online archive of digitized rare books, available here. That archive has a section with prayer books, dating from the very earliest printing presses, in the 15th century. Reportedly, it is only in the 16th or 17th centuries that this psalm was gradually incorporated into Ashkenazi siddurim. In fact, the earliest example I found on line is the Siddur Raavan; Ostraha, 5577 (1816/17); folios 34b-35a, from no earlier than the 19th century! All other examples I found were printed even later. So where hence did this Psalm wander into our prayer books? R’ Prof. Issachar Jacobson (Netiv Bina, vol. I, pg. 186) cites Avraham Berliner (professor of Jewish history and literature in R’ Esriel Hildesheimer’s rabbinical seminary) approvingly, claiming that its inclusion was a publisher’s error; it was originally recited there in the Sefardi rite only during ‘Hanuka. Whoever included it – erroneously – into an Ashkenazi siddur, forgot to point out that it was meant only for ‘Hanuka! According to Berliner, some siddurim contain a further error, in that they skip the title verse of the Psalm and begin with Aromimekha (“I will exalt Thee”). Abe Katz (author of the excellent series of Beurei haTefilla newsletters) cites Rav Munk to the same effect. Likewise, R’ Avraham Landau (Tzelota deAvraham, pg. 147) remarks that it is neither found in Rav ‘Amram Gaon’s siddur, nor in the halakhic codices Tur and Shul’han ‘Arukh, not even in the Sefardi siddurim! (but that is incorrect, as we shall soon see –AF) However, for R’ Landau, the inclusion was not an error; it was intentional, following the teachings of the Ari, R’ Isaac Luria, as expounded upon by his disciple R’ ‘Hayim Vital (Peri ‘Etz ‘Hayim, Sha’ar haMizmorim, ch.4). So the case is open and shut, right? The inclusion of Ps. 30 in the Ashkenazi prayerbook dates from the 17th century (as documented by Berliner), and despite Berliner’s claim (which had been accepted by R’ Jacobson and R’ Munk), we can trace the reason for its inclusion to a teaching by the Ari. Right? The thing is, assuming that the dating of the siddur is correct (the title page is missing and there is no introductory section, with approbations or essays, so I do not know based on what they managed to date the volume), it was printed some 35 years before the Ari was even born! Secondly, we saw above that the SheLaH’s siddur does not include it, despite the fact that the SheLaH was one of the major teachers of Lurianic Kabbala and who incorporated many such ideas in his own siddur, and despite the fact that it was published in 1717, when, according to Berliner, Ps. 30 was already appearing in Ashkenazi siddurim for several decades. The reason for Ps. 30’s inclusion in the siddur may be kabbalistic, but if the above is correct, it surely predates the Ari’s teachings. According to R’ Dr. Seth Mandel (presently of OU fame), in a personal e-mail exchange, it was also included in old Yemenite siddurim, further confirming that its inclusion in the Levantine rites is ancient. Furthermore, while the Ari may have expounded upon that Psalm, it may have been in order to explain the Sefardi rite, without necessitating its inclusion for Kabbalistically correct prayer, as indicated by Ps. 30’s absence from the SheLaH’s siddur. In other words, its inclusion in Ashkenazi siddurim may have been Kabbalistically motivated, and it may be still be argued that that was erroneous. However, its recitation was likely not mistakenly taken over from ‘Hanuka, as we will see in the next section. (Halacha 2) Why was it said that we should recite psalms for each and every month? As Rabbi Shim’on ben Laqish, of whom Rabbi Yo’hanan inquired: May we recite [the Levite’s sacrificial] hymns without [when we cannot offer] libations? He said to him: Let’s deduce it from that [teaching]: “In both [the day of the destruction of the First and Second Temples], the Levites stood on the podium and said: (Ps. 94:23) “And He hath brought upon them [the enemies] their own iniquity.” … therefore the people have the custom of reciting the sacrificial hymns in their proper times [despite the absence of sacrifices]. … For whoever recites a verse at its proper time, it is considered it as if he built a new altar [for the Temple] and brought upon it an offering. למה אמרו שיאמרו מזמורים בכל חודש וחודש, כר’ שמעון בן לקיש דבעא קמיה ר’ יוחנן, מהו לומר שיר בלא נסכים, אמר ליה נשמעינה מן הדא, בזה ובזה היו הלוים עומדין על הדוכן ואומרים “וישב עליהם את אונם”; … לפיכך נהגו העם לומר מזמורין בעונתן, … שכל המזכיר פסוק בעונתו מעלה עליו כאילו בנה מזבח חדש והקריב עליו קרבן. The second ellipsis above is where the text discusses the Shir shel Yom, the daily psalm, which was recited by the Levites at the Temple service, and is recited nowadays at the conclusion of the morning prayer service. In its continuation, the text discusses psalms recited on a variety of special occasions, as they were in the Temple. Thus, it is clear that Ps. 30 is the daily psalm for ‘Hanuka, to be recited after the morning service, unlike what we were discussing, which is its inclusion before Narukh sheAmar, i.e. a the beginning of the service. Berliner, however, claimed that in Sefardi siddurim, there was a note indicating that Ps. 30 is only recited on ‘Hanuka, what was that about? As can be seen in this Sefardi Siddur from Tzfat, 5592 (1831/32), there is indeed a note at the beginning of Ps. 30 regarding ‘Hanuka: the title verse “Mizmor Shir ‘Hanukat haBayit leDavid” is only recited on ‘Hanuka, however, the note clearly does not apply to the entire psalm, for the rest of the psalm, starting with ארוממך (“I will exalt Thee”) is always recited! [I]t was based on the Kabbalsitic idea that the Psalm מזמור שיר חנוכת הבית לדוד provides the transition between the עולם העשיה and עולם היצירה. Kabbalists will understand what that means. He also offers another, novel, speculative interpretation, which you may find by clicking on the above link to his essay. It seems high time to at least pay lip service to original Minhag Ashkenaz, as still practised in Basel. Siddurim that include Ps. 30 before Barukh sheAmar should note that its inclusion is recent, may have been in error, but for Kabbalistic reasons, and that its inclusion was not accepted by all communities. All that, without claiming that it waved over from ‘Hanuka. This entry was posted on Friday, July 31st, 2009 at 8:30 am and is filed under English, Essay, prayer. You can follow any responses to this entry through the RSS 2.0 feed. You can leave a response, or trackback from your own site. According to the siddur Eizor Eliyahu (the one that seeks to recreate the nusach actually used by the Gra), whose editors had access to the old siddurim, the first appearance of the mizmor is in Shklov, in 5548 (1788). Interesting, I wonder whether Berliner’s statement that it entered the Ashkenazi siddur in the 17th century (quoted, by the way, by Artscroll, which apparently studied Netiv Bina in preparing its commentary – they are much broader than we give them credit for) was merely an educated guess. In Pri Eitz Chayim, all of Birchos HaShachar are stages in the raising of Asiyah toward Yetzirah. The Braisa of R. Yishmael specifically raises the 3 rishonos of Asiyah which now rest on the 3 lowermost of Yetzirah. He goes thru each Middah and shows which sefirah or aspect thereof it represents. Kaddish is certainly a staircase, so to speak. In sha’ar hazemiros in Pri eitz chayim perek 2, he deals with aromimcha hashem after hodu. He notes that there are 15 Pesukim and 91 letters (gematria havayah adnus), and 10 shem havayos, and the purpose is to unite z”a and nuk, as well as yud and kei. BTW, it is easy to get. 91 = havayah + adnus = zivug of Za (havayah) and nuk (adnus). 15 = yud-kei. so it’s a zivug of malchus, which is asiyah in this erech, with za, which is yetzirah here; from another perspective, binah with chochmah. Since it seems to accomplish the actual zivug — the ultimate unity of asiyah with yetzirah as shnei melachim b’keser echad, that allows total progression to the next realm — it seems like a lechatchilah, that Ps. 30 really needs to come after everything relating to asiyah (i.e. including hodu) and before baruch sheamar, the start of yetzirah. I wonder how the SheLaH and R’Ya’aqov Emden proposed transitioning from the תפילת העשיה to the תפילת היצירה, considering that both incorporated the Lurianic kavanot in their respective siddurim, while neither included Ps. 30 before Barukh sheAmar. Let me add something: as significant as saying Aromimkha is according to the Ari, the psalm, both among S’faradim and Teimanim, always immediately precedes the recitation of “H. melekh, H. molokh, etc.”, which is said twice, and some following p’sukim. The latter is said standing according to the Ari (I have not seen evidence that people stood for it before the Ari). R Chaim Vital attaches great signficance to it, and so it is incorrect according to the Ari’s kabbolo to say only aromimkha without the next part, which is also part of the transfer from ‘asiya to y’tzira. Since aromimkha was in the 1524 Venice edition that RCV used as the basis for his comments, it is unquestionable that it was not put in because of the Ari, nor did RCV intimate that it was, but rather was part of earlier Nusach S’farad, as was the H. melekh. All the Ari did was to put an explanation ‘al pi (or ‘al peh!?) kabbolo for the existing nusach. Perhaps R. Berliner original statement is not being quoted correctly, but such an explanation is really negligence, since a very brief search would have shown that all S’faradim today (and going back a while) say it every day of the year. As far as the issue of when it first appeared, it is possible (despite what the Ezor me’Eliyahu says) that it occurred earlier. 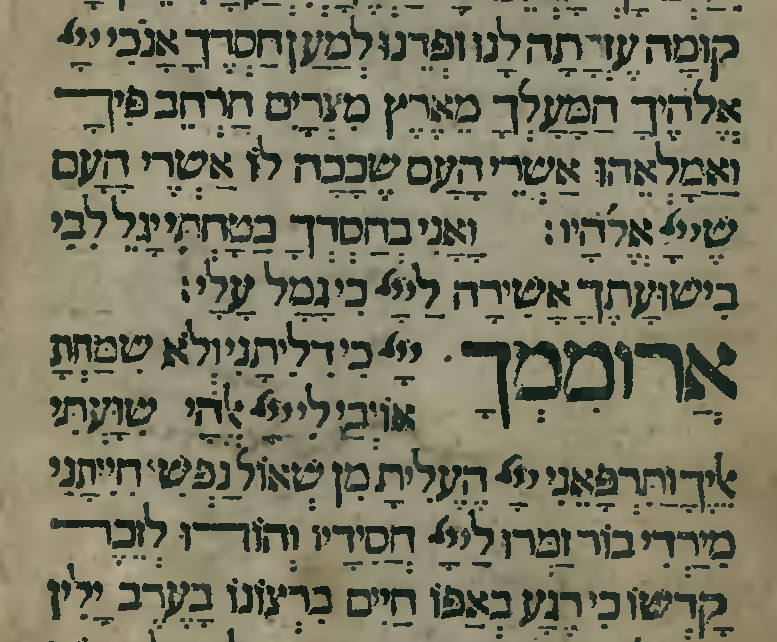 Many things from the Ari (or, as in this case, erroneously attributed to the Ari) appeared originally in the margins of Ashk’naz siddurim in the 17th century, not in the main text, so a careful examination of an actual hard copy may be necessary. Allow me to comment on your musings on Psalm 30 — which I found highly intelligent and thought provoking. Your questioning of the assumption that the Ari is the source of placing Psalm 30 into the Prayerbook is convincing. Let me, however, elaborate on the Rav’s חידוש concerning recitation of this Psalm before ברוך שאמר. For simplicity’s sake, I will continue in Hebrew. זכורני שהפעם ששמעתי מפיו של מו”ר זצ”ל על ענין זה, הזכיר שדבריו בנויים על פסקו של הגר”א שאין להקדים שום פרק תהילים לפני “ברוך שאמר”. כאן הסביר הרב במונחיה המיוחדת שלו, שבאמת אסור לו לאדם להשתמש בפרקי תהילים בלי רשות מיוחדת בגלל קדושתו של תהילים, ולכן משמש “ברוך שאמר” בתור “מתיר” לכלול תהילים כחלק של תפילה. ולכן העדיף לומר פרק ל’ זה אחר אמירת ברוך שאמר במקום לפניה כמו שמובא בסידורים שלנו. I emphasize again that I enjoyed your thoughts on the subject, and I hope that I have been able to add something to the theme. Thank you very much for this additional information. I think that the Rov was trying to accommodate the recitation of Ps. 30, which, nowadays, has become de rigeur in most communities, despite the fact that it doesn’t belong in minhag Ahskenaz and indeed clashes with Minhag Ashkenaz, in that the reason why we recite hodu after Barukh Sheamar is exactly what the Gra supposedly held and which the Rov so beautifully articulated. The Rov could instead have opted for following the Gra completely and leave out Psalm 30. After all, the Rov must have been familiar — from his Berlin and Paris days — with the older custom not to include Psalm 30. That he didn’t was probably due to his desire to accommodate current predominant practice, perhaps in order not to deviate too much from what other worshippers do, so as not to be פורש מדרכי הצבור. * Sefardim never felt any compunctions against reciting part of פסוקי דזמרא before ברוך שאמר, as is evident from their recitation of הודו – and on Shabbat and Holidays all the additional psalms – before that opening blessing. They rather worried about interrupting the flow between ברוך שאמר and ישתבח by introducing the additional readings, hence recited them before ברוך שאמר. That is why I stressed that the Rov was trying to square the practice with Minhag Ashkenaz.